Since 1919 KitchenAid has taken inspiration from the professional world to design its appliances for all lovers of gourmet cooking and all those who want to have an extraordinary experience inside their kitchens. In 1919 an engineer from Ohio, Herbert Johnson, created a stand mixer – the model H-5 – equipped with the exclusive planetary movement. KitchenAid was born. The stand mixer soon became an icon of design and the cornerstone of a vast range of large and small home appliances. The rest is history. Today KitchenAid is a full kitchen resources brand that offers a complete line of small and large appliances, ceramic ovenware, cookware and utensils. All the products stand out for their exceptional attention to detail. For the design of the appliances, KitchenAid relies on the advice of chefs and professionist pastry chefs: updated on the latest culinary trends, they develop and design accessories and innovations to complete the product range. Thanks to this long history of stimulating collaborations, KitchenAid appliances are products of high quality, refined creations offering performance worthy of the kitchens of the best award-winning restaurants. 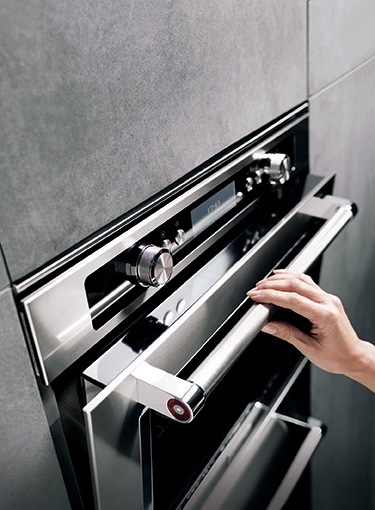 Touch and sight are the first senses involved in the experience of KitchenAid appliances. In fact, the products of the brand are synonymous with refined craftsmanship, durability and excellent materials, deployed with painstaking attention to detail. For example, stainless steel provides a strong, immediate sensation of stability and a perception of outstanding quality. Based on the Artisan stand mixer, KitchenAid design is always timeless, distinctive and audacious, bringing character and style to any kitchen. It is sturdy, elegant, authentic and at the same time functional because it manages to satisfy the practical needs of all chefs and all lovers of gourmet cooking. Since the birth of the iconic stand mixer in 1919 and the first home dishwashers in 1949, KitchenAid products have been created as must-have items in the kitchen. Day after day, KitchenAid designs and creates products for constantly improved performance, ready to interpret new trends and needs. The range is stands out for professional performance levels, high-quality details and iconic design. Today the kitchen is not only for those who love to cook or have a passion for gourmet refinement; it is also a place for all those who are curious about new experiences and networking, creative people in search of new trends for inspiration, professionals interesting in learning about new technologies or new lifestyles. All these users represent the target for the new KitchenAid aesthetic of large appliances, always excellent tools to improve culinary skills, now presented with a new design conceived to meet all practical and aesthetic needs. 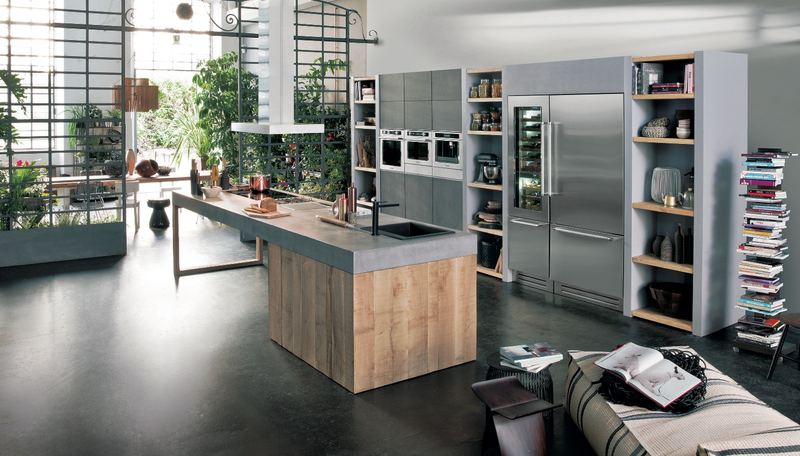 Today KitchenAid updates its design to perfectly interpret the emerging needs of a more convivial kitchen. Inspired by the iconic Artisan stand mixer and the brand’s logo, the new look comes from carefully selected details, synonymous with high quality and fine craftsmanship: a touch of the historic red, excellent materials and emotional references, refined and discreet finishes. 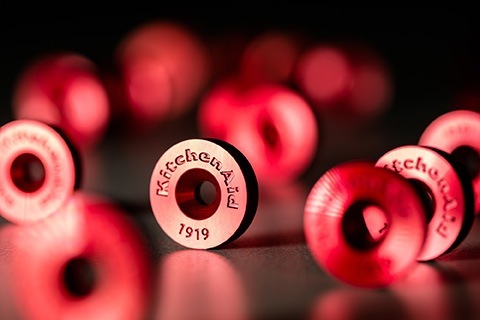 It is a sophisticated touch of red – intense, full-bodied color – placed at the sides of the handle, on which the KitchenAid logo and the date of the founding of the brand, 1919, have been engraved. The tone selected for this strong characteristic sign is a clear reference to the Artisan stand mixer. 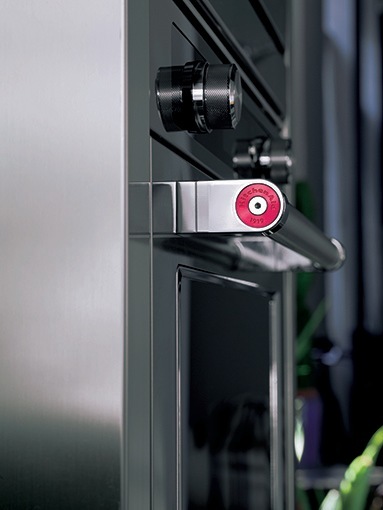 A distinctive sign – inspired by the appliances of professional chefs – designed to guarantee a safe, solid grip. The ergonomic details facilitate operations connected with the preparation of foods. Not a decoration, but a signature. Why hide the magic of the creations that are made inside the oven? This reasoning has led to the idea of enlarging the oven windows (featuring glass treated with nanotechnologies) and framing them in a chrome-plated relief border. The knobs of the ranges reflect a harmonious encounter between the contemporary touch of chrome, the industrial look of brushed steel, the enamel red of the index and the sophisticated knurled texture. The new White Display interface is modern, clear and easy to use. It represents the main accessway for the professional functions of KitchenAid appliances: from leavening to dehydration, desserts to bread. The badge with the KitchenAid brand of the new collection of large appliances, just as in the past, is a precious detail, the “signature” in steel relief. 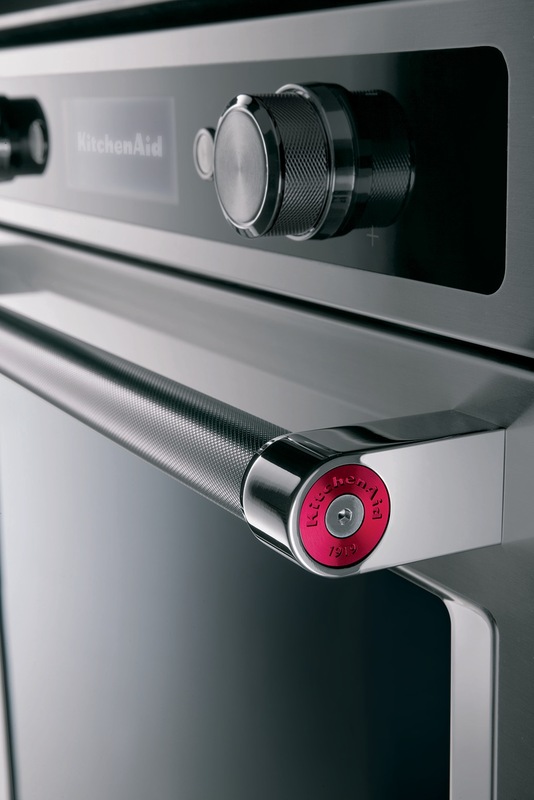 The knurled handles are a distinctive sign of the new KitchenAid aesthetic. Inspired by the appliances of professional chefs, they are designed to guarantee a safe, solid grip. The red badge is a sophisticated touch of intense color placed at the sides of the handle, with engravig of the KitchenAid logo and date of the founding of the brand, 1919. KitchenAid appliances offer professional performance, high-quality details and iconic design, inspired by the emotional impact of the Artisan stand mixer. Chef Touch is an innovative system that brings vacuum sealing into the home for the first time. The perfect embodiment of the new look of KitchenAid. 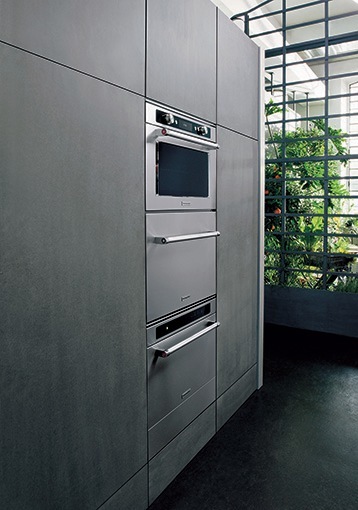 The KitchenAid steam oven is ideal for sous-vide cooking, thanks to its precise temperature control system. Together with the vacuum sealing and blast chilling devices, it is part of the Chef Touch system. The tone chosen for the red badge is a clear reference to the Artisan stand mixer that has always been the symbol of everything the brand represents: a kitchen that welcomes, encourages you to get your hands dirty, to experiment, to take part.